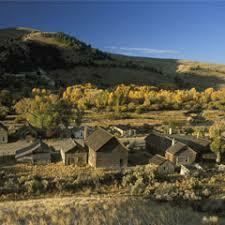 The National Historic town of Bannack is where Montana’s first major discovery of gold took place. The abanded buildings are preserved for historic display. There is one tipi and two campgrounds. 24 campsites, each with a table and fire ring. Some sites reservable. Activities: Biking, fishing, hiking, touring, wildlife viewing, historic tours, interpretive trail, and picnicking. Vaulted toilets and water are available. Open year-round. Bannack State Park is located in the southwestern area of Montana. Take I-15 south of Dillon to exit #59 (Highway 278 exit.) Drive west on Highway 278 for 17 miles. 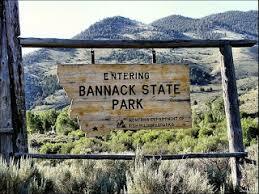 Turn south onto the Bannack Road and travel four miles. Park entrance road will be on the left-hand side.